I read this week’s Memo from Chaim Even-Zohar with great interest. I think that Chaim is finally willing to be a bit more honest and less diplomatic about the current state of diamond industry. Nevertheless, despite the data is in his article, the collapse of the industry did not suddenly happen–it was a long process. Chaim sees the one side of the equation –the oversupply of rough, because his focus is, as always, on the rough market. I believe that the problem is the growing under-demand. One way or another, the financial result is the same. No money is left in the industry: there’s $45-50 Bn of unsold polished stock, which amounts to a three-year supply (as I previously estimated), and huge debt which is only partially covered by diamonds that nobody wants or can buy at any price. Now De Beers is planning to lose its last proper luxury marketing element – the exclusivity of the sightholder. They do not understand the value of the asset they plan to dispose–once it’s gone, it’s gone for good. If we look at this cynically, sightholder exclusivity allowed De Beers to wash a good amount of unneeded goods at premium prices in the last ten years. They used their clout and influence; now there’s nothing left. The Emperor is Naked. Unfortunately, this time the onlookers do not laugh. 500 diamond industry insiders gathered over the weekend at in Antwerp, forming workgroups and discussion groups to discuss the way forward for the industry – prior to the industry’s emergency Diamond Summit on Monday. …will translate to a decrease in demand for loose polished diamonds at wholesale of about 20 percent, and a 35 percent fall in the amount of rough diamonds required. [But] Let us keep things in perspective …under current circumstances, a 10 percent fall in demand at retail is not the end of the world. A review of major industry bankruptcies in recent years shows that these were triggered by a combination of mismanagement of assets (money, stocks) and the resultant cash flow problems – exacerbated often by a bank that tries to be the first to put hands on collateral. Too many diamonds – too little cash. The Antwerp council was productive on many fronts, but the most positive thing to emerge from this session was the debate prior to the event. It was clear to me that there is a groundswell of desire among participants to return to marketing generic diamonds, something I have long-advocated. And this in turn, creates a necessity for new forms of collective and collaborative leadership. It is vital for the industry to rally around a new breed of leader, and a new self aware and confident style of engagement. The diamond industry must find a leader who is able to guide the industry’s actors to examine and share their appreciation of these paradoxes, rather than merely cope with, or suppress them. This was a good, constructive and hopeful event for the industry. I am off to buy a new, and brighter-coloured pencil. Genie out of the bottle – more transparency in diamonds? Recently, six companies lost their DTC Sightholder status following the result a criminal case in Antwerp. On December 6, 2007, the Antwerp Correctional Court convicted these diamantaires (and seven others) of fraud, fictitious invoicing and smuggling between 1994 -1999. The judges refused to approve a settlement between the Belgian prosecution and the thirteen diamantaires, and gave the companies a six months suspended jail sentence. The DTC is also suspending these companies’ diamond supplies. This editorial, “The Genie is out of the Bottle,” by Chaim Even-Zohar, makes an interesting argument that it wasn’t so much fraud as industry practice at the time that these (relatively small) companies were doing–they were actually increasing their taxable income by moving values that were ‘hidden in inventories’ to actual revenues, which the law now makes companies do. Their conviction is merely for show when larger companies with greater transgressions at the time were not targeted in the lawsuit. In any case, Even-Zohar believes the decision will accelerate growth of transparency, good governance, and Best Practice Principles in the diamond industry. Do you agree? Can commoditisation be good for diamond prices? Part 1. Two critical diamond industry events have thus far passed under the radar of mainstream media. They deserve an airing here as they signal a shift to open-access, transparent, and globalised diamond trading – a far cry from the industry’s heritage in tight handshake-based relationships. First: The creation of a $400m Diamond Circle Capital Fund, an investment fund which will invest in $1m+ high end diamond. The fund is the brainchild of commodity asset management specialist Diapason. Second: The development of a diamond futures market by industry ‘wild child’ Martin Rappaport, based on ‘bread and butter’ brilliant diamonds – high quality rounds between 1.01 and 1.19 carats. The classic engagement ring ingredient. Both measures aim to address fundamental weaknesses in the existing diamond trade: while consumer demand is solid (if not exactly strong) and extraction capacity is solid (if not exactly strong), the centre of the diamond pipeline is in deep trouble. The distribution arteries of the industry are clogged. Rough dealers, manufacturers and polished wholesalers are finding it hard to breathe. Both stock and debt levels are at record highs. It’s the first move – the investment fund – that I want to address first. According to industry commentator Chaim Evan-Zohar, these measures should attract much-needed external capital into the industry, and will enable manufacturers to shift goods which would otherwise get stuck in the distribution, or shifted on at a bargain rate; they need deep pockets to hold onto. 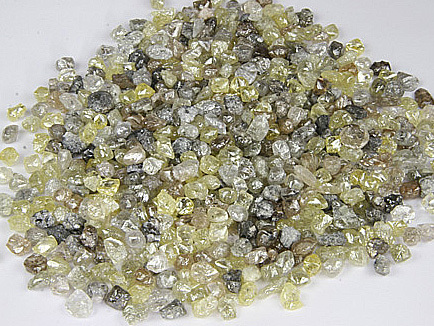 There are dozens of good diamond manufacturers who will not even try to compete for the truly large rough stones, because they cannot be sure that they have the right connections. The Diamond Circle Capital fund significantly widens opportunities for the trade to sell large polished stones. As De Beers’s historic monopoly passes into history, a period of uncertainty emerged in which the industry needs new pathways to get goods to consumers. After a long period in the dodrums, Chinese and Indian demand is on the rise for smaller goods, and oligarchs increasingly need something shiny to please their soon-to-be-ex-wives. The is now some hope that the industry may finally be emerging from its doldrums. This hope, and desparation at the status quo is encouraging a new wave of innovation. Both these new measures rely upon the fact that diamonds can be traded as commodities. By picking narrowly defined segments – one highly volatile and one highly stable, the measures will introduce powerful, albeit potentially conflicting price signals into an opaque marketplace. But the question is, who will this benefit. Does it really help manufacturers? Does it really help consumers? Critically, will it help investors? For manufacturers there may well be be a one-time injection of funds as they sell difficult to shift of stock to the Diamond Circle fund, but thereafter, it’s unlikely the fund will have the sales capability to shift much stock. If it does, the potential for misleading transactions is immense. On the one hand it promises to set a benchmark by disclosing genuine sales figures rather than tax-cogniscent guesstimates. On the other hand, the integrity of these transactions will be very difficult to assure. What liquidity is there really in a rolling stock of 100 or 200 diamonds? The proposed participants are actually rich rough dealers with little sales experience. Selling large diamonds is an art form, making the buyer feel like a queen. Manufacturers should stay well away. Building on his observation, it’s not the business of a fund, or even, really, of an auction house to sell these diamonds. It’s quite possible that the fund may actually act to suppress value rather than enhance it. Secondly, the fund is likely to have a disproportionate number of difficult to sell or ugly diamonds – if a dealer has a really quality large diamond he is likely to be able to find a more value-adding route for it. The third point is that not all diamonds have value. Period. Some are just not saleable, at any price. Although the aggregation created by the fund is likely to smoothe out the risks of holding these diamonds, on average it will probably overvalue the diamonds it contains. The sooner the industry finds a way to step back from this abyss, the sooner it may regain a luxury premium.